Deschutes Trout fishing on my mind! Come join us for some of these great spring trout adventures. It’s early February and I’m sitting here in my office in Oregon looking out at the snow. The sun is shining and the blue sky is brilliant but its freezing cold! That’s got me thinking about fly fishing for trout when it’s warm and sunny! The crew at Water Time Outfitters has a great lineup of fly fishing opportunities and classes this year to get you into trout. Here is the highlights on the schedule currently. Join us for a culinary fishing expedition into the wilds of the Deschutes Canyon with star chef Jason French in spring’s prime time for trout. Three days of pampered fishing with pro guides Rob Crandall, Todd Rettmann and Jason French; chef-owner of the beloved Ned Ludd. 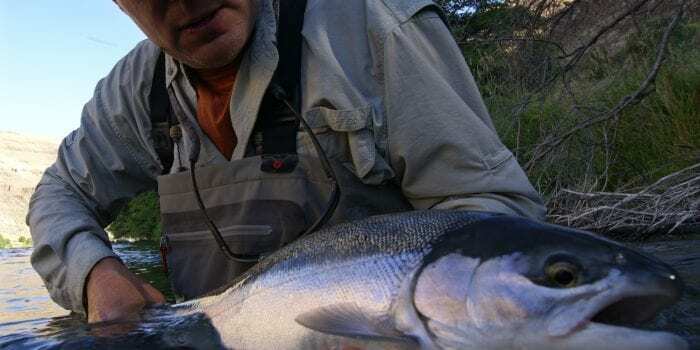 Set in the deep canyon of the lower Deschutes situated in the heart of Oregon’s high desert this fishing, camping and culinary expedition is sure to please. Comfortable riverside camps set the scene for a world class trip and the campfire time in the evenings is always a highlight. Come join us for great food, fly fishing and memories of a lifetime. Find more info and sign up on our website here. Start off your fly fishing career right with good fundamentals and lots of fun! This introduction to fly fishing is a great course for the beginner or those in need of a little refresher course. It makes a great gift and is fun for the whole family. Join instructors Rob Crandall and Todd Rettmann of Water Time Outfitters, professional local guides years of experience sharing their love of fly fishing! This all day class covers the fundamentals you need to get going the right way on the world famous Deschutes River. Don’t let the mystery of fly fishing keep you from enjoying this great sport. Let us help you untangle the myths of fly fishing and get you started out right. Class in conjunction with Royal Treatment Fly Shop. Sign up on Royal Treatment Fly Shop here. Fly fishing fundamentals and lots of fun! This introduction to fly fishing is a great course for the beginner or those in need of a little refresher course. This day long class is hands on training to get you going! Join instructors Rob Crandall and Todd Rettmann of Water Time Outfitters, professional local guides years of experience sharing their love of fly fishing! This all day class covers the fundamentals like: knot tying, entomology, fish behavior, rigging, fishing techniques, casting basics and much, much more! Don’t let the mystery of fly fishing keep you from enjoying this great sport. Let us help you untangle the myths of fly fishing and get you started out right. Class in conjunction with Royal Treatment Fly Shop. Sign up on Royal Treatment Fly Shop here. Water Time Outfitters is owned and operated by Rob Crandall and his team of hard working guides. Rob has been past editor of Flyfishing & Tying Journalmagazine, a licensed fishing guide for over 26 years, featured speaker in Oloughlin’s Sportsmans Shows, seen on Flyfish TV, Columbia Country TV, Frontier Unlimited TV as well as featured in the DVD-Winter Spey Strategies; the Salmon Trout Steelheader Magazine, the Flyfisher, Flyfishing & Tying Journal and Salmon Steelhead Journal. Rob grew up on the Clackamas River and loves to share his passion for fly fishing with others.